I used to associate all tentacly seafood with rubber, mostly because of the deep fried “octopus rings” widely available in many restaurants. That is until I spent a few weeks in Milan on business, and tried their insalata di pulpo i.e. octopus salad. The dish had bite-sized tentacle pieces in olive oil and lemon juice, and the meat was more tender than the best chicked I’ve ever had. 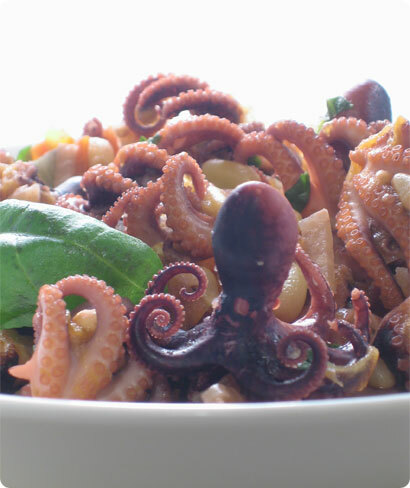 From that day on I’ve always looked for different octopus/calamari/sepia dishes whereever I go. Unfortunately I haven’t spent much time in Mediterranean countries famous for their seafood, but in addition to Italy, I’ve had great octopus dishes in Puerto Rico and Macau. Thaw the octopi in cold water if frozen. Set aside. Cut the onion in small cubes, crush the garlic, and saute in olice oil until soft and golden brown. Add the tomatoes and boil a few minutes. Add the baby octopi, and simmer for 5-10 minutes, until cooked. Season with salt and pepper to taste. Run through a sieve to discard extra juices. Hi! :) Sorry to hear about your floor! Besides it looked like a nice one and I hope that hasnt been damage too much! While I’m sorry to hear about the damage to your home, I must say this recipe sounds delicious! We eat baby octopus often and will definitely be trying this recipe. Hi Fiordizucca, the floor was damaged all right, but the contractor’s insurance buys me a new one, so no worries :) I have an octopus craving again, and actually *saw* a couple of quite big octopi in Helsinki – but the price was a totally outrageous €27 / kg. Ivonne, I’d be super interested to hear your best baby octopus recipes! Paikka l?ytyy Tukholman vanhasta kaupungista, saksalaiskirkon kupeesta. P? ?kujalta yksi “yl?sp?in”, jos menn? ?n rantaa kohti niin vasemmalle siis. Mist?s sait nuo octopukset? Olivatko niit? Stokkalla myyt?vi? italialaisia pakasteita? Pit?? ehdottomasti maistaa! Aseanic Tradingista 3. linjalta. Vii Voanissa lienee my?s. Molemmissa on mainiot valikoimat eksoottisia pakastekaloja. Heat the oil in a pan with a lid. Add the onion and saute until the onion softens. Add the octopi and saute on high heat for 2 to 3 minutes if using baby octopi, 5 to 6 minutes if using larger octopi, being sure not to burn the onion or octopi. Add the wine and stir well. Lower the heat and partially cover the pan. Cook for 5 to 10 minutes or until the wine and liquid in the pan has reduced and thickened. Serve with the fresh bread.